“Photographers and artists have always found inspiration in their immediate location. There is a concept within Welsh culture called Y Filltir Sgwar (The Square Mile), described above by Professor Mike Pearson. It is the intimate connection between people and their childhood ‘home’ surroundings. 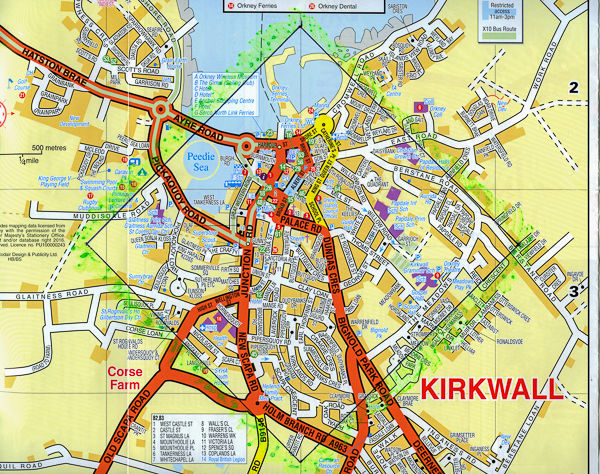 In 1983, between my first and second years at Glasgow University, I spent the summer back home in Kirkwall. Nothing much seemed to have changed; nor did it seem likely to change at any point in the foreseeable future. Glasgow, on the other hand, already seemed to be in a permanent state of flux. Almost the first thing I noticed when I returned in the autumn was that the derelict facade of the Grosvenor Cinema on Byres Road had been pulled down and rebuilt. A simple opposition was established: Orkney- rural, eternal and unchanging, a little bit dull; the city – mercurial, fluid, exciting. My idea of a romantic landscape leant more towards a neon sign reflected in a puddle than some blasted heath or a Turner-esque storm at sea. If anyone asked me whether I missed Orkney, I would answer that it was still there, to be visited any time I wanted. I visited pretty much every year, at first at Christmas and then – after the birth of my son – in the summer, when going to a beach was fun rather than blowy. At some point I realised that not every settlement of 5000 people had an eleventh century cathedral in its middle. Gradually I became aware that some views (or rather skylines, like the one you caught sight of as you rounded Wideford Hill on the way out to Finstown) were etched somewhere deeper in my skull than simple memory. Cathedrals are aligned with the points of the compass and, wherever you stand to get a wide view of the town, you can see the cathedral with its tower sticking up above the lower buildings that surround it. And – while at some level I denied it – I became aware that Kirkwall was changing after all. The cathedral spire was no longer green; its verdigris-ed copper coating had been replaced with new. And more and more. The next summer, after this had sunk in, I started nipping out on a bike on brief, targeted missions to take pictures of places where significant buildings had stood. The wartime hut where my band had rehearsed every Wednesday evenings and Saturday afternoon; Kirkwall Grammar School; the view from my front door, no longer blocked by a sycamore we had planted; the swings where I went up to the jerks ; the cinema where I had watched Bond and 633 Squadron, Chariots of Fire, Scum and Quadrophenia, The French Lieutenant’s Woman and Dirty Dancing; the shop where I bought my first electric guitar; the woodyard where mum had bought timber to build me a bed; the gasworks, which stank to high heaven…. This entry was posted in Coursework, Identity & Place, Introduction on April 25, 2017 by Simon Chirgwin.